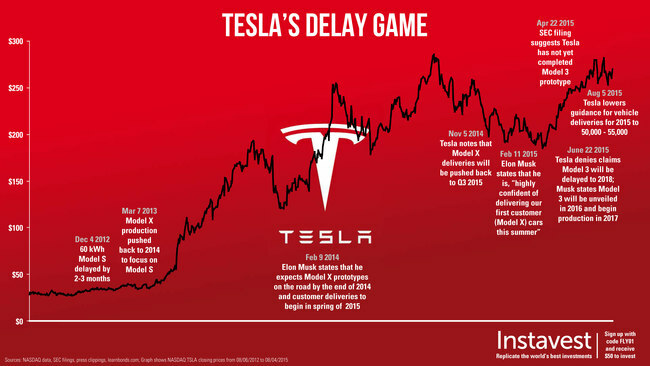 Yesterday, Tesla [(NASDAQ:TSLA)]([https://www.google.com/finance?q=NASDAQ:TSLA) reported earnings for Q2 2015. Tesla beat revenue and earnings estimates of -$1.17 billion (non-GAAP loss per share of $0.60) by posting results non-GAAP revenue of -$1.20 Billion (non-GAAP loss per share of $0.48 cent). That’s approximately triple the loss of Q2 2014, fueled by the company’s aggressive growth initiatives and spending around the oft-delayed Model X and the Nevada battery factory, which the company hopes to open in 2016. Additionally, Tesla lowered its guidance on vehicle sales for this year. The original estimates were put at 55,000 Model S and Model X deliveries for 2015. Yesterday, that number was cautiously lowered to 50,000 to 55,000 total cars, adding that gross margin may decline. Consumers are still waiting for the first Model X delivery, which has been multiple times since its initial unveiling in 2012 - Tesla now states that deliveries will begin by the end of the next quarter. Simply put, in a choice between a great product or hitting quarterly numbers, we will take the former. To build long- term value, our first priority always has been, and still is, to deliver great cars. However, Tesla’s history of delays and the news yesterday impacted its stock as it slipped 6% following the earnings call., Above, you’ll find a series of announcements over the past few years that have typically been off-set by positive sales momentum for the Model S and/or expansion plans. Investors, however, may be growing impatient with the company’s inability to turn a profit and meet expectations.